From Friday 8th to Sunday 10th of June, there has been a large farmers market on the upper part of Oslo's parade street, Karl Johans gate. I took a two hours walk in the hot summer weather to look, smell and taste products from the entire country. These producers are the true food heroes, sharing a passionate love for what they produce. There were a wide range of product under offer. 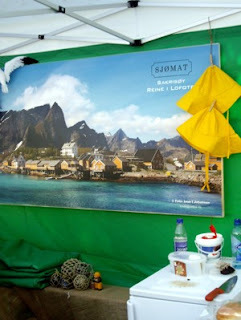 The producer Sjømat (Seafood), located on Sakrisøy at the Lofoten archipelago had different fish products to sell, caught in the cool northern seas and processed locally after old traditions. The products from this small producer, impressed us, and we were given samples of some of the specialities. 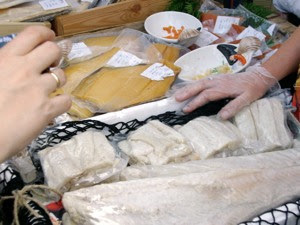 In the foreground you see the dried cod, or Baccalà, that has been produced in these areas for centuries. This product is treasured in Italy, Spain and Portugal. It was exported from northern Norway to the continent as far back as the Middle Ages. In the background there was salted and smoked halibut, and smoked wild salmon under offer. 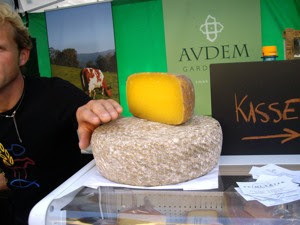 Another interesting producer is the Avdem farm dairy, located at Lesja in the northern part of the Gudbrandsdalen valley. This cheese, Fjelldronning (Mountain queen) is their pride, an unpasteurised white, well matured cheese made from cows milk. It had a wonderful aromatic taste. They also produce fresh unmatured cheese, with and without herbs and garlic, freshly made sour cream, and butter. Norway is changing rapidly, and other nationalities have much to teach us. And they are changing the face of Norwegian food production as well. 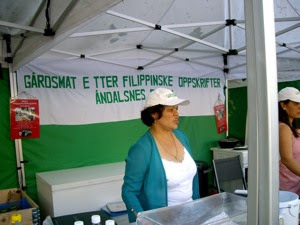 At the farmers market we saw these filipinos, that produce and sell their specialities, directly from the farm far away from the urban jungle, at Åndalsnes, located at the North Western coast. "Farm food after traditional filipino recipes" - meat skewers and spring rolls. Welcome to the wonderful changing world of food!! Sadly this large farmers market was a stunt, but luckily there are farmers market once a month at Vibesgate on Majorstuen in the borough of Frogner once a month on Saturdays from 10 AM to 4 PM. Here are the dates, in case you would like to buy some locally made products.